Fun and Unique Chairs that Hang for Your Home! Amazing Cool Hanging Chairs for the Porch! Chairs that hang are exactly that! 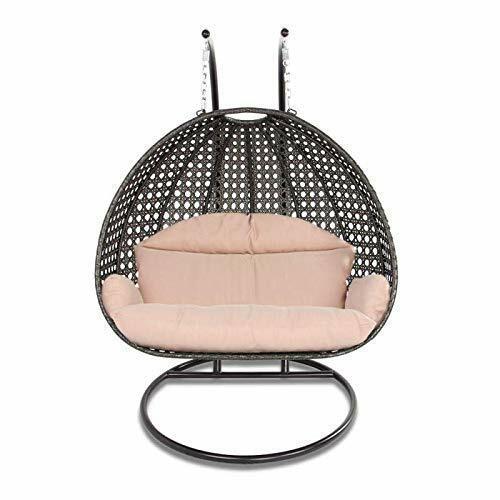 Fun egg-shaped or round hanging chairs! They are very, very cool and very inviting too! I just found the coolest chairs that hang for home and gardens! They are very unique looking and so much fun to use! I went crazy when I found them and knew I had to create a special page just for them! Here you are going to find amazing chairs that hang from the ceiling as well as comfy and unique looking ball-shaped hanging chairs with a stand, so you can put them anywhere you want! Just imagine how fun it will be to read your favorite book or just listen to music inside these unique hanging chairs! Some of them look like a cocoon…. My favorites are the porch hanging chairs with lots of pillows inside! *This one in the picture is a gorgeous and very comfortable spacious sturdy chair that hangs for two people! Who needs to travel anywhere when you got this?? I love the comfy cushion inside! Wherever you put this stylish hanging chair, I’m sure it’s going to make your room or porch look amazing and very inviting! Is it a hanging chair? This is the life we were meant to have! You don’t need to travel far to experience peace and relaxation…. You can do it right from your home! With a cool and comfortable chair like that, you can transform any space into a relaxing getaway! Is there a more creative way to relax in your home? 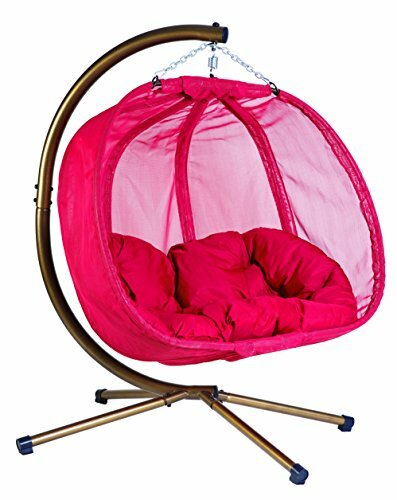 Just play some nature sounds, close your eyes and relax inside your unique cocoon shape hanging chair! This gorgeous large porch swing chair for 2 people is one of my favorite hanging chairs for sale! It’s beautiful, it’s comfy and it’s large! Perfect to have in a quiet corner somewhere in your porch or backyard so you can either listen to the rain or the birds while you just relax for a while or read a book! It comes with two stands. 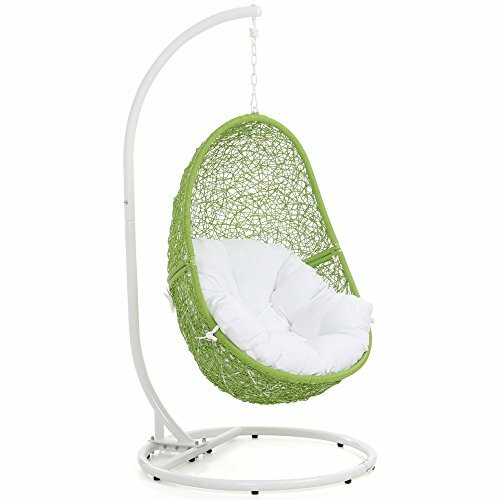 What a cool and comfortable cute lime-green color outdoor hanging chair for sale! 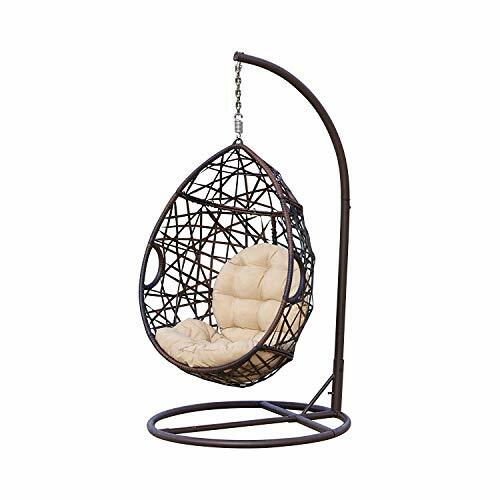 It is made of a sturdy synthetic rattan weave that is weatherproof and an aluminum frame. I love the beautiful white cushion too! It is also among my favorite outdoor hanging chairs from this page! A cool chair like this also makes a great housewarming gift idea! The price is not too bad either! Can you see yourself in there ‘just hanging’? 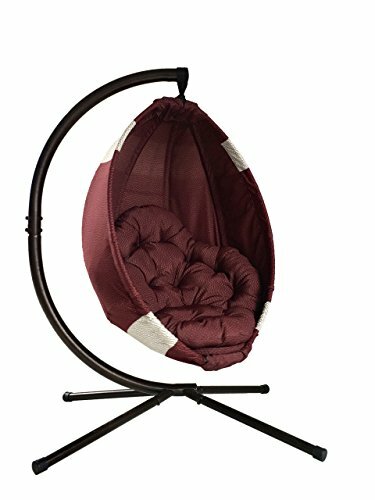 This is a fun and comfy affordable football-shaped porch hanging chair for sale! It is very strong and cute! What would you use this hanging chair for? 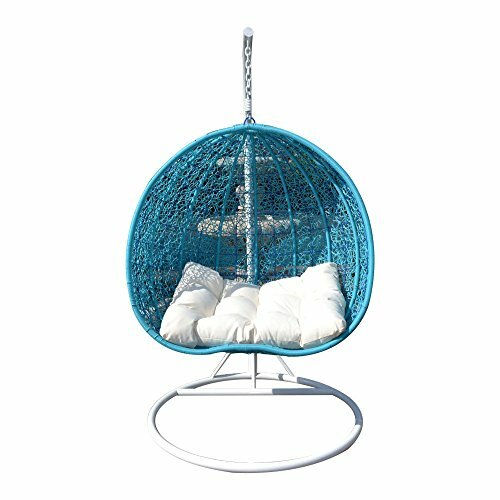 *What a gorgeous outdoor egg-shaped porch hanging chair with a stand to have by your pool! I am definitely in heaven! How lucky can someone be to be able to enjoy this amazing egg-shaped hanging chair? Where are you going to place this gorgeous chair folks? Well if you don’t have an ocean view but have a lake view, you can also enjoy yourself a lot inside a cool and modern-looking outdoor hanging chair, right? 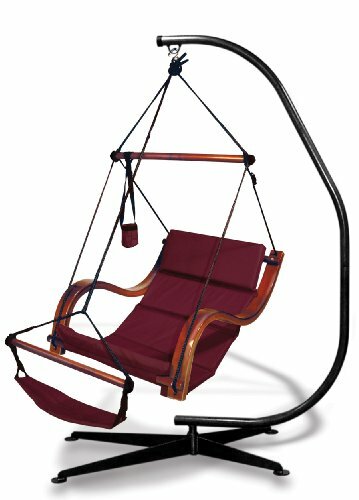 You can have this hanging chair near a lake, a swimming pool, a tree, a pond, flower beds, your pool, on your porch or anywhere you want! It is a fun piece to have outside! Each one is more inviting and cool than the next! 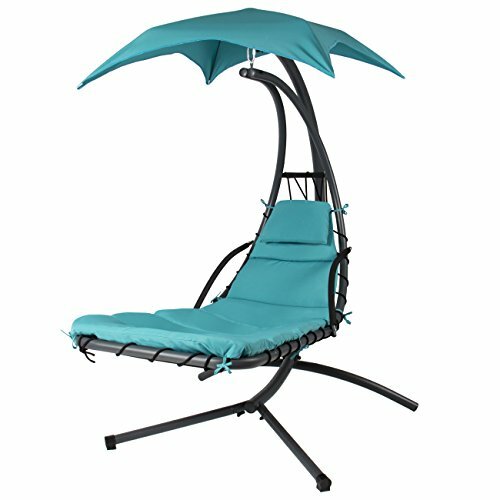 This is a heavy-duty, very strong and super comfortable gorgeous turquoise color outdoor hanging chair that will fit two people! The weight capacity is 418 lbs! I think it’s a great ‘marriage’ between hammock and chair, all in one, isn’t it? The all weather wicker material makes it safe to leave this hanging chair outdoor without problems! Now all you need to do is grab a nice book and head to your new hanging chair! 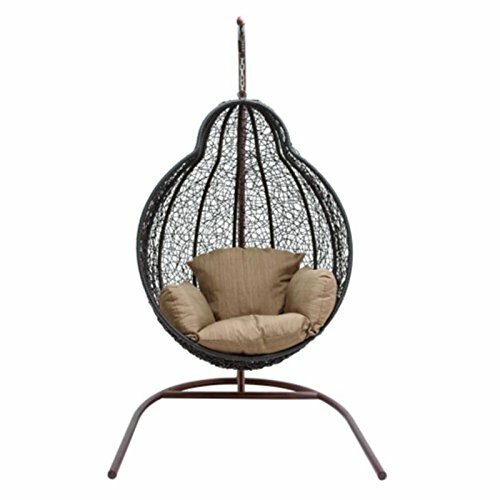 The Most Awesome and UNIQUE Hanging Chair for Sale! How cool and gorgeous is this ‘pear shaped‘ outdoor hanging chair folks? It’s more than just a ‘chair’! Can you see yourself sitting on one of those cool chairs that hang? Imagine how nice those cool hanging chairs will look near a pool! Just make a nice and cool lemonade and enjoy the outdoors! This one is definitely one of my favorites! You can ‘hang it’ pretty much anywhere you want! By the pool, under a tree, on your porch, patio, anywhere! Modern Hanging Chair with Canopy for the Porch! Very Cool Hanging Chaise Lounger Chair! 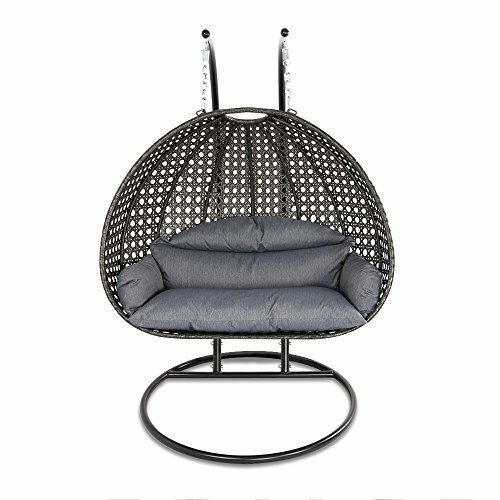 This is one of the most unique and very modern chairs that hang with canopy for your porch! It has a very cool design and a beautiful teal color! You can have it indoors or outdoors, on your porch or backyard. It does look super inviting! So, who wants to ‘hang’ today? *How about a comfortable hammock recliner hanging chair? It is a hammock hanging recliner chair! Makes anyone want to magically transport themselves to this place! Sometimes visuals speak louder than words! Just stare at this picture for a few minutes and imagine yourself there…. Grab your favorite book, your favorite beverage, wear comfy clothes, take off your shoes and enjoy this wonderful hanging chair! Absolutely perfect to relax with a good book! Beautiful Large Outdoor Hanging Chair for Two People! Oh Gosh, I can’t get enough of these beautiful outdoor hanging chairs! Each one is cooler than the next! Are you looking for chairs that hang for two people? This is a gorgeous and very cool-looking dual sitting wicker swing chair for sale! Great for relaxing with your better half! Will make your backyard, porch or patio look awesome! It includes a beautiful cushion! I wish I had a huge mansion by the beach just to have ALL of them in my house! How to choose only one? *How gorgeous is this large outdoor hanging chair for two people with a comfy cushion? Guess what time is it?? Gorgeous HOT PINK Outdoor Hanging Chair! I love this gorgeous hot pink (or red?) pumpkin shape outdoor hanging chair! It goes beautifully with the bright and comfy hot pink cushion! Just grab a nice and cool drink and your favorite magazine! *I hope you enjoyed my selections of cool hanging chairs!